While walking home from the movies on a dark and spooky night, Scooby and Shaggy find a suit of armor in an abandoned truck. It turns out that the knight was supposed to be sent to a museum, so the gang takes the suit of armor to the museum. At the museum, the gang discovers that the Black Knight comes alive during a full moon, so they decide to investigate the case. 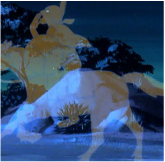 - This episode has a different title card done by Hoyt Curtin. - Fred is still listed as "Ronnie" in the original storyboards for this episode. His name was not changed to Fred at the very end stages of animating the episode. 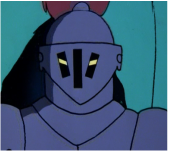 - Velma's mouth doesn't move when she says "So that's what the Black Knight wanted." - Daphne's eyes disappear when she blinks in the office room. On a foggy night, the gang accidentally runs their boat aground on a deserted island. However, as the gang explores the island and Vazquez Castle, they find out that a phantom is haunting the island who doesn't like visitors. - This episode has been re-released on 17 different home media sets, more than any Scooby-Doo episode to date. - Bluestone loses his gloves erroneously when Scooby falls on him. - Daphne's cuffs turn white when she is holding the key. - Scooby loses his spots and Velma's skirt loses its pleats in the first scene where the gang is on the boat. - There is a widely debated controversy that this episode may have aired third, after "A Clue Named Scooby-Doo." - In the TV show Young Sheldon, Sheldon's little sister Missy is seen watching this episode, in "A Dog, a Squirrel, and a Fish Named Fish." 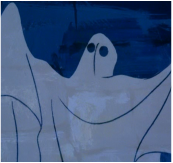 During the gang's beach party, Scooby runs into a seaweed-covered ghost. After the beach party, the gang goes to the Malt Shop and finds out the same ghost that Scooby saw has been sinking ships. They decide to investigate and go diving under where Captain Cutler has been seen, but run into the ghost everywhere. - Shaggy's hair turns the color of Fred's when he sits on the rock. - The episode's title card is differently designed from the rest of the series. - When Shaggy runs into the umbrella, it turns red despite the fact that it was blue before. - There is a widely debated controversy that this episode may have aired second, before "Hassle in the Castle." Shaggy reads the map upside down and gets the gang stranded in Gold City for the night. While walking around town, they find that the town is deserted because of the Miner 49er, a mysterious ghost from 1849 who is supposedly still searching for gold in the old mines. - Daphne's scarf turns purple when they first arrive at the hotel. - Velma's lips appear like she may be wearing lipstick when the gang first hear about the Miner 49er. However, her lipstick quickly disappears and never again shows up for the remainder of the episode. - When Daphne falls down the mine shaft, Fred somehow turns his head 180 degrees, which is presumably an animation glitch. - Scooby's left foot flashes blue and his nose flashes brown when he is picking apples. Scooby watches a dognapping, so the gang investigates Buck Masters, one of the most well-known dog owners in the city. He claims that dognappers are kidnapping dogs all over the city and believes his dog will be next. The gang makes Scooby a decoy for the dognapper so they can capture him, but the plan backfires when Scooby is dognapped by a witch doctor. - The picture of Bob Miller's Great Dane appears different each time. The first time when Fred is holding it, it is a whole body shot of the dog. However, the second time when Shaggy's holding it, it is just a head shot. The gang visits their friend Sharon, only to find Sharon's uncle has been turned old by a ghost. The gang tries to solve the case, but when the ghost kidnaps Sharon, and turns Uncle Stewart into a skeleton, it appears the gang may be next. - Daphne's voice comes from Velma's mouth twice throughout the episode. Daphne visits her uncle, who is filming a movie entitled The Apeman of Forbidden Mountain, but the movie becomes all too real when a real apeman appears and tries to hurt the lead actor. - Velma's glasses lenses are missing toward the beginning of the episode. While clam picking on the beach, the gang sees a nearby amusement park's lights suddenly come on, even though the amusement park wasn't scheduled to open yet. When they investigate, they find all the rides are running by themselves and a mysterious man is running around the carnival. - Daphne's headband turns green when she asks if they should restack the balls for the next person at the Ball Toss stand. While walking home, Shaggy and Scooby see someone drop a violin case full of money out the window. The problem is, the money is counterfeit! While investigating, the gang becomes trapped in a puppetmaster's house that is full of living puppets. The gang sees a strongman and a midget while driving near a circus. The two claim to have seen a mysterious ghost clown, who broke their bike and nearly injured them. When the gang checks out the circus, they find out that they really are telling the truth, and become hypnotized by the evil clown. - When the Ghost Clown says "give me that whistle," the black part of his costume turns red. The gang stops at a fortune teller's wagon on their way to Franken Castle. The gypsy tells them never to go to the castle, but they ignore her warning. They shouldn't have however, it turns out that a werewolf, Frankenstein, and Count Dracula himself are living in the castle and aren't very fond of visitors! While the gang is visiting an archaeology museum, a 3,000 year old mummy comes to life and turns the museum owner into stone. The gang has to solve the mystery before they all turn into stone! -- The LEGO Scooby-Doo Mummy Museum Mystery set is loosely based off of this episode. After an unsuccessful fishing trip, the Mystery Inc. gang becomes lost in a swamp and ask an old man for directions. They must then flee for their lives when the man turns out to be a zombie. After escaping, they visit a local gas station and find out a witch is haunting the swamp. When they go investigate, Daphne is captured by the witch and the gang must rescue her. - When Scooby holds the Shaggy voodoo doll, his paw turns green like Shaggy's shirt. - The type of cap the Zeb voodoo doll was wearing changes based on the scene. - Saloon is misspelled as "Salon" in one scene. - The LEGO Scooby-Doo Mystery Machine set is loosely based off of this episode. When the Mystery Machine runs out of gas, the gang must ask for help from a farmer. It turns out that there is a space alien haunting the abandoned airfield that the gang is stranded in, and the gang must try to dodge the alien throughout the airfield. - Fred's left hand is missing in the shot where he's hanging from the hook. - When Daphne tells the sheriff that the Space Kook is escaping, her words come from Velma's mouth. When the gang reads in the newspaper that C.L. Magnus's business is being ruined by a ghost, they offer to help Magnus. 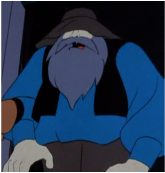 The gang attempts to trap Redbeard, but end up only being trapped on his creepy ghost ship. 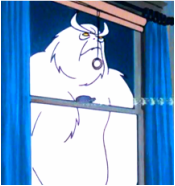 - Velma's eyes briefly disappear when outside waiting for Mr. Magnus to open the door. - Daphne's eyes are too low when the butler opens the door the first time. - When in the cave, one long shot shows that there are straps keeping the treasure chest lid closed. No straps appear in any other shots. Scooby is about to inherit a fortune from the late Colonel Sanders, but he finds out there's a catch...he must spend a night in the Colonel's house, which is haunted by two phantoms. - The aquarium beside Shaggy's sandwich has nothing in it, but suddenly, the menacing goldfish appears inside of it in the next shot. - The Green Ghosts' chains switch back and forth between arms depending on the scene. - Velma's glasses are missing their lenses when she tells Shaggy to follow the Phantom Shadow's footprints. On a trip to a ski resort, the gang encounters a vengeful Snow Ghost at their hotel. When they investigate, they find an old Tibetan man who explains that the monster is actually the ghost of the Yeti...and is out for revenge. When the ghost of Mr. Hyde hides in the Mystery Machine, the gang investigates the home of Dr. Jekyll, who claims to be turning into the ghost every night. ​When Daphne buys a mask at a curio shop in Chinatown, two Chinese zombies chase the gang for the mask and capture Daphne. The gang goes to the Temple in the Hills to rescue her, but they all end up captured by the creepy ghost Zen Tuo and his undead army. - Scooby's arm turns the color of Shaggy's shirt when digging in the fish. - After being unmasked, Zen Tuo's costume turned a different color. On their way to a barn dance, the gang discovers an unconscious bank guard who tells them "The flame will tell the Creeper." 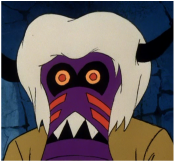 When they bring him to the bank manager's house, they find out the Creeper is actually a phantom who is robbing banks. The gang goes to the barn dance anyway...but little do they know, the Creeper has followed them to get a paper that the bank guard gave them. - When Daphne asks if Velma is okay, her leggings are missing. - Right before unmasking the Creeper, Scooby's neck turns the same collar blue as his collar. - Daphne's scarf turns purple and Fred's mouth doesn't move as Fred says the case is over and they can go to the Malt Shop. While fishing at Oceanland, Shaggy accidentally catches a caveman frozen in ice. They give the caveman to Oceanland, but when they return, they find the caveman has been thawed out and is now living...and very angry. - When Shaggy is fishing and calls for Scooby, his mouth doesn't move. - The heater which melts the caveman goes missing for a split second. - Daphne says "And that's what gave Professor Wayne the idea for his scheme" with Velma's voice. The gang is on their way to a rock festival, when they become lost and must ask for directions. The man they ask tells them that they can take two ways - the long way or the short way. They choose the short way, but they end up running out of gas near a seemingly abandoned house. They go into the house, only to find that there is a mysterious knocking sound and the Headless Spectre roaming the halls at night. - Shaggy's nose is missing when he holds Scooby in his arms, in the scene where the gang meets Asa. - Daphne's leggings are missing when they fall into the cellar. Shaggy and Scooby go to their 48th luau, courtesy of Mr. John Simms, but when Mr. Simms is kidnapped by a witch doctor, the gang must go to a haunted Hawaiian village that is rumored to be spooked. ​- This is the only second-season episode not to have a chase scene song. On a camping trip, the gang hears a werewolf howling and decide to investigate. Nearby, they find an open grave and follow the footprints near the grave to an old saw mill....where they find that they may be following the ghost of a werewolf. While doing a dance contest at KLMN with Johnny Sands, a wax phantom appears and kidnaps the TV station manager and Johnny. When the gang attempts to investigate, the Wax Phantom kidnaps Shaggy and Scooby, so they can become part of his wax family.